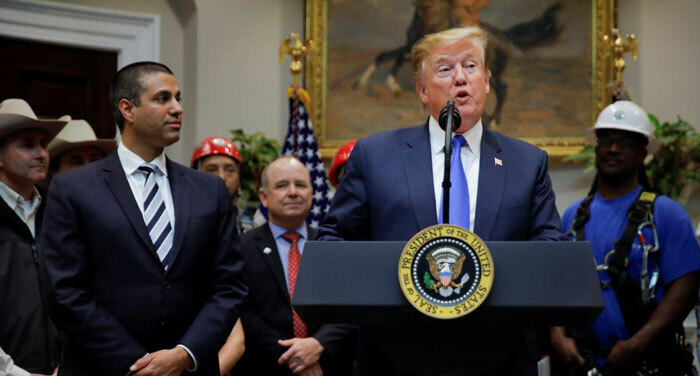 Starting Dec. 10, the Federal Communications Commission (FCC) will begin auctioning three chunks of millimeter-wave frequencies (upper 37 GHz, 39 GHz and 47 GHz) for cellphone companies to use. Some Trump allies had tried to persuade him to effectively nationalize this technology as a matter of national security. Trump acknowledged that he considered such a plan -- opposed by the FCC and others -- but ultimately backed away from it. "We don't want to do that. It wouldn't be nearly as good, nearly as fast," Trump said. "It also makes no sense in relation to competition with China -- these are different markets in different phases of development." 5G -- with speeds 100 times faster than the current 4G mobile internet -- will allow the emergence of everything from so-called smart cities and farms to self-driving cars. "We want Americans to be the first to benefit from this new digital revolution while protecting our innovators and our citizens," said FCC Chairman Ajit Pai. "We don't want rural Americans to be left behind." The $20.7 million Rural Digital Opportunity Fund, to come from existing FCC subsidy coffers, is intended to connect up to 4 million American homes over the next decade. The expensive fiber rollout is seen as essential for carrying wireless network communications back to internet hubs. "Intervention at this level will encourage private investment and accelerate coverage in these hard-to-reach areas -- the economic and social benefits of rural coverage make it worth intervening to help make the market work," Brown said. One challenge is the lack of U.S. manufacturers of 5G network equipment, an arena where China's Huawei and ZTE are set to dominate. Trump's 5G goals are in conflict with the Federal Trade Commission's stance on Qualcomm, the world's largest chipmaker. The FTC has sued the American company over anti-competitive pricing, according to technology analyst Patrick Moorhead, president and principal analyst at Moor Insights & Strategy. Korea last week switched on its nationwide 5G network. Korea-based Samsung is offering itself as a global alternative to Chinese equipment manufacturers, but it still lags Huawei and ZTE, as well as Sweden's Ericsson and Finland's Nokia. Lower frequencies, which are being licensed for 5G in several other countries, would need fewer cell sites, but that spectrum in the United States is held by satellite operators who are reluctant to give it up. "There are proposals to free some of it for fixed wireless, and the mobile industry wants it for 5G," Brown said.